PAKISTAN’s economic system seems to be threatened by the unexpected and incredible rise in the price of crude oil in international market in recent period. About 100% increase in crude oil prices in short span of few years has exposed the economies of 3rd world countries about to collapse. Pakistan is shortly approaching the crisis situation regarding its energy resources. At present we meet our energy requirement from coal, hydro, nuclear, oil and gas reserves. Despite of being rich in gas reserves, our gas supply is still finite. It is therefore unequivocally crucial to look for alternate energy sources in order to save our natural gas reserves. Out of four traditional fuels in automotive sector of Pakistan, petrol, diesel and LPG are petroleum based fuels while CNG is non petroleum alternate fuel source with two principle benefits of being cheap and environment friendly. According to the facts Pakistan is the first in Asia and third in the world in term of number of CNG stations (About 1500). Sucrose extracted from sugarcane accounts for little more than 30% of the chemical energy stored in the harvested parts of the mature plant. Almost 35% chemical energy lies in the leaves and stem tips, which are left in the fields during harvest. Remaining 35% chemical energy is contained in the fibrous material (bagasse) left over from pressing. Brazil is the world’s largest sugarcane ethanol producer and a pioneer in using ethanol as a motor fuel. In 2009 the Brazils sugar and ethanol export generated approximately 9.9 billion US$ and in 2012/13, Brazilian ethanol production reached 23.2 billion liters (6.1 billion gallons). All gasoline sold in Brazil includes a blend of 18 to 25 percent ethanol and has achieved greater energy security. In fact, Brazil has replaced almost 40 percent of its gasoline needs with sugarcane ethanol fuel. Many observers take the Brazil’s experience as a case study for other nations seeking to expand the production of renewable fuels and have identified two key factors for success which are Sugarcane Ethanol and Flex Fuel Vehicles (especially designed for ethanol fuel usage). Moreover, Brazil has several experimental programs for the production of electricity by using sugarcane ethanol as fuel. 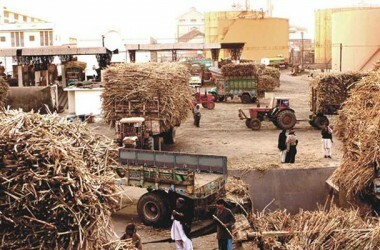 During the past decade in Pakistan the number of sugar mills remained constant but the total production of sugar has gone up promising for the use of sugarcane by products. 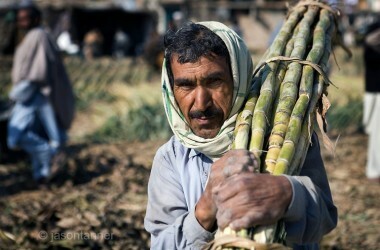 Sugarcane ethanol is an alcohol-based fuel produced by the fermentation of sugarcane juice and molasses. Sugarcane ethanol is a clean, affordable and low-carbon biofuel emerged as a leading renewable fuel for the transportation sector. Ethanol can be used in a blend with gasoline at levels ranging from 5 to 25 percent to reduce petroleum use and also as pure ethanol fuel made up of 85 to 100 percent ethanol depending on country’s specifications. For the successful implementation of fuel grade ethanol, it is imperative to get the knowledge about its production technology. It is obtained by the application of fermentation, distillation and dehydration processes. Fermentation is the process of converting sugars into ethanol and carbon dioxide. Process is practiced with yeast in complete absence of oxygen. Ethanol obtained has high water content and cannot be used as fuel in any form. Distillation is carried out to remove the water from ethanol and gives 95-96% ethanol with rest amount of water. This fuel can be used as stand-alone fuel in modified engine but cannot be blended with the gasoline. The final step is dehydration. It uses desiccants for further removal of water content producing 99.7pc pure ethanol. Sugarcane ethanol is made from the sucrose found in sugarcane juice and molasses. This current process taps only one-third of the energy sugarcane can offer. The other two-thirds remains locked in leftover cane fiber (bagasse) and straw. Scientists have discovered new techniques to produce cellulosic ethanol from leftover plant material. This complex process involves hydrolysis and gasification technologies for the breakdown of lignocellulose into sugar. Cellulosic ethanol can be obtained from diverse raw materials and its production requires a greater amount of processing than customary sugarcane ethanol and is therefore currently more expensive. Once engineers and technical experts make perfect its commercial-scale manufacturing, production price will come down and cellulosic ethanol might double the volume of fuel coming from the same amount of land planted with sugarcane. Here are some benefits of ethanol fuel over the traditional fossil fuels. Most importantly, ethanol adds oxygen to gasoline which helps to reduce air pollution and harmful emissions in tailpipe exhaust. Sugarcane ethanol cuts carbon dioxide emissions by 90 percent on an average as compared to gasoline proving itself better than any other liquid biofuel produced at commercial scale. It is a high-octane fuel that helps to prevent engine knocking and generates more power in higher compression engines. Moreover ethanol reduces global dependence on traditional fuels. In spite of the other qualities, ethanol produced from sugarcane can prove itself the economically viable and good alternate fuel source. At present it is expensive and tedious job to take it as alternate fuel source but it is not quite impossible to get the benefit. Government should announce policies and packages for researchers to make effort enough to get cheaper and environmental friendly biofuel in the long run.